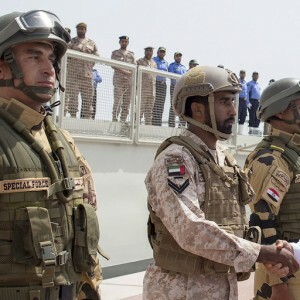 The Arab Spring, the perceived threat from Iran and the alarming rise of the Islamic State in recent years have all forced the United Arab Emirates (UAE) to rethink its foreign policy. The UAE launched expanded military operations in Yemen against the Iranian-backed Houthi movement. The Horn of Africa accordingly became an essential site from which wide-ranging naval and air operations in Yemen could be launched, troops and supplies could be moved and the sea blockade on Yemen could be carried out. To exercise a measure of military influence in the southern entrance to the Red Sea facing Yemen, the UAE developed closer military relationships with Horn of Africa states and personal relationships with their governing elites – which are calculatingly seeking foreign security guarantees as a trade-off. But the UAE’s military deployments have not necessarily been welcomed by everyone. In 2015 the UAE established its first military base overseas in the Eritrean port of Assab. This derelict port was transformed into a functioning airbase, deep-water port and military training facility. The move raised the ire of substantially stronger Ethiopia, which views Eritrea as its primary external threat. Ethiopia fears that the establishment of an enhanced Emirati base would allow an embattled Eritrea to come out of its diplomatic isolation, and even give it the upper hand in their bitter 19-year conflict. Earlier this year the UAE established a second military base in the port of Berbera in the self-governing but unrecognised Somaliland. The move raised hackles in the Horn of Africa. The government of Somalia raised concerns over the establishment of the Emirati base given that any foreign military presence in Somaliland – that it considers to be part of its territory – would irreversibly undermine its territorial integrity and sovereignty. Likewise, Ethiopia was surprised and displeased by the establishment of the base. It is traditionally very close to Somaliland, and is also wary of all Gulf inroads into the Horn of Africa – which it considers to be its strategic backyard and an extension of its internal concerns. It also regarded with suspicion the motives and explanations for the agreement made in 2016 between the UAE and Somaliland. According to this agreement, Dubai Ports World would manage the port of Berbera. For a decade, Dubai Ports World managed the port of Djibouti, through which the entirety of landlocked Ethiopia’s merchandise passes. A very public confrontation between the head of the Djiboutian Air Force and Emirati diplomats in 2015 illustrated the limits of the UAE’s influence. Wrong-footed, the UAE failed to diplomatically resolve the dispute and broke off relations with Djibouti. Nonetheless, the UAE appears to have broadened its involvement in the Horn of Africa where it has always generously invested. There were reports that one single Emirati corporation would invest $10 billion in Sudan. Moreover, in 2016 the UAE signed trade and investment agreements with Ethiopia where it has been financing developmental projects. Relations have incrementally improved between the UAE and Ethiopia, but there has been no reset button as Ethiopia continues to oppose the Emirati base in Eritrea. The UAE also gave generous financial assistance to Somalia, provided it with military equipment and financed a military training facility there. On the face of it, with the establishment of two military bases in the space of only two years, the UAE has cemented its new role as a significant player in the Horn of Africa. Yet analysts and diplomats charge that the UAE lacks a thorough understanding of the unpredictable forces, events and trends in this complex region where alliances rarely remain for long. Critics also claim that the UAE hasn’t planned to minimise the unexpected adverse effects of deploying its military power. These effects include worsening the complicated political and military rivalries between neighbours – Ethiopia and Eritrea, and Somalia and Somaliland – and increasing the likelihood of a head-on collision. Dr Mehari Taddele, a prominent analyst, recently wrote that Emirati policy towards the Horn of Africa was short-term and fragmented. He also wrote that the UAE did not view the Horn as a strategically integrated entity and cherry-picked partners which happened to be the region’s smallest and most vulnerable states. In other words, the UAE had adopted a high-risk approach from the start. Dr Patrick Ferras, an experienced observer of the Gulf and the Horn of Africa, went so far as to say that ‘post-Arab Spring Emirati activism may unsurprisingly contribute to the militarisation of the Horn of Africa and, even more dangerously, alter the existing balance of power in this conflict-ridden region’. The UAE has rapidly managed to establish a sphere of influence in the Horn. This influence may expand and help stabilise the region but it should take into account the geopolitical interests of regional states and not undermine them.